A person who transplanted the mixed multitude of tribes from Babylon to Samaria after the fall of the latter city (Ezra iv. 10). It has been conjectured that this word is a misreading for Assurbanipal, though the reference in Ezra iv. 2 is to Esarhaddon. The reading Asbacaphath in I Esdras v. 69 suggests that a ב ("bet") has fallen out. 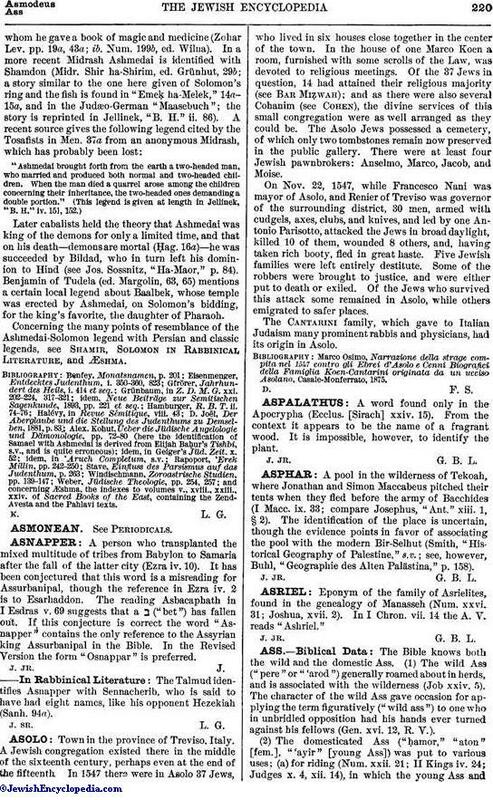 If this conjecture is correct the word "Asnapper" contains the only reference to the Assyrian king Assurbanipal in the Bible. In the Revised Version the form "Osnappar" is preferred. The Talmud identifies Asnapper with Sennacherib, who is said to have had eight names, like his opponent Hezekiah (Sanh. 94a).